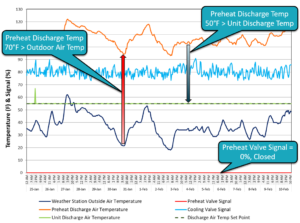 The Air Handling Unit (AHU) preheat coil valve was leaking when signaled closed (0% valve signal), resulting in a preheat discharge temperature that was over 40 degrees warmer than the required temperature. As a result, the cooling coil valve opened simultaneously to maintain the final supply air temperature at its setpoint of 55°F. The simultaneous heating and cooling resulted in excess heating and cooling costs.This issue was not detected in the occupied spaces due to proper space temperature control and lack of comfort complaints; however, it was identified with Analytika. Learn how Analytika can help you. Previous Previous post: A hospital saves over a million dollars in annual energy costs while improving comfort, sustainability, and social responsibility in the community.